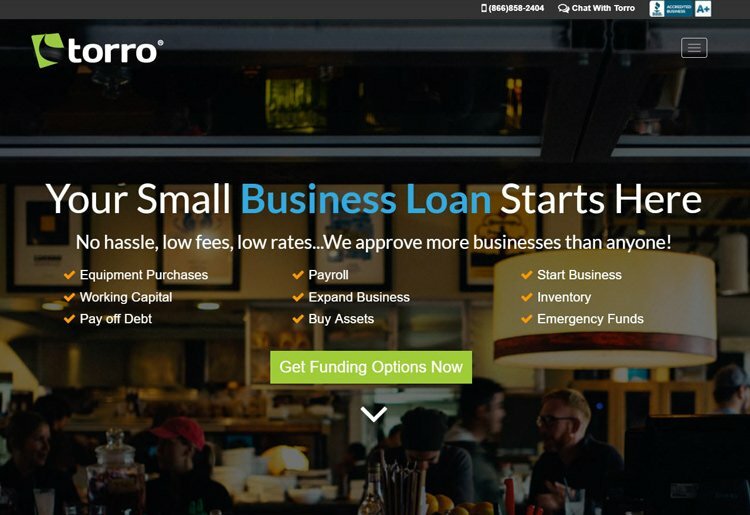 Torro offers five main types of business funding for new and existing companies, including startup funds, working capital loans, and merchant cash advances. The application process is simple, approval is fast, and funding is usually received within 48 hours. 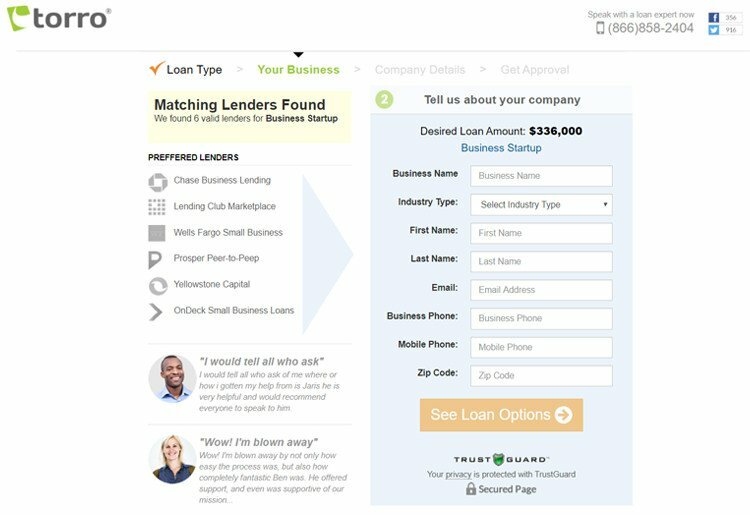 By using basic personal and business information to suggest a selection of suitable lenders, Torro’s loan matching process makes it easy to find the funding your company’s needs. The company is also able to handle merchant cash advances, accounts receivable loans, and asset financing. Because credit score is only one factor among the many considered, you can apply for funding through Torro no matter where your rating is on the spectrum. While some lenders may look for higher credit than others, Torro’s broad network allows the company to match your business with the most suitable financing options. Even “high risk” businesses have a chance of getting loans through one or more lenders in their network. No collateral is required for funding, making the application process simple and fast. In most cases, approval comes through in under an hour, and funds may be delivered in as little as two days. When you need money to get your business through a slow season or cover expenses during a time of unpredictable cash flow, Torro can help you secure a working capital loan or merchant cash advance and make the funding available as soon as possible. Financing from providers in Torro’s network can also be used to stock up on inventory, purchase new equipment, or finance projects designed to grow your business. Startup loans are divided into two different categories: documented ventures and “idea based” ventures. 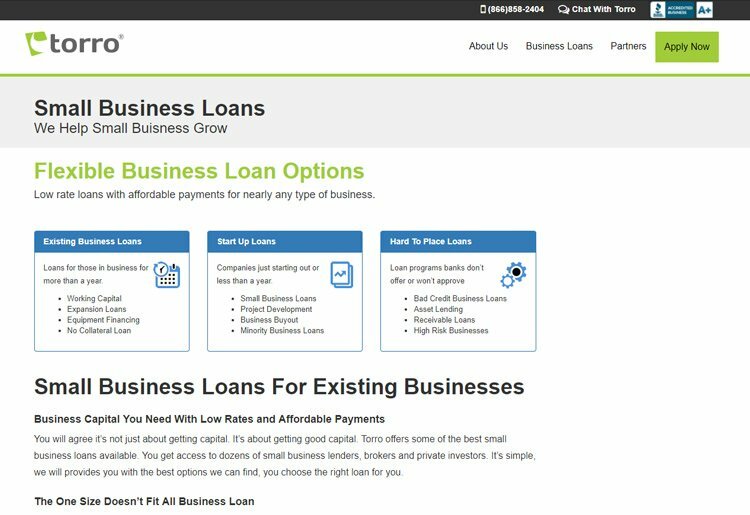 This provides the flexibility to apply for a loan whether your business idea is laid out with a detailed plan and financial projections or you’re still working on the specifics of your dream venture. You don’t have to wait until every aspect of your vision is put down on paper to apply for funding and get started on the path to becoming a successful business owner. Unlike online lenders providing direct funds to customers, Torro doesn’t have a concrete list of basic requirements. Each loan type has its own guidelines for qualification, and individual lenders often consider additional factors. Some lenders may ask for other documentation or proof of assets depending on the loan type for which you apply. A minimum credit score is required in certain cases, but other financial information may be accepted as an alternative. As with many online loan matching services, Torro’s application process is simple. Applying for a traditional loan can mean spending days or even weeks looking up information, gathering paperwork, and filling out forms with no guarantee of approval. Torro asks for only a few pieces of personal and business information, and applications may be approved in under an hour. Torro matches businesses with as many potential providers from these categories as possible, allowing you a great deal of flexibility to choose the ideal type of lender based on financial products, proposed terms, and interest rates. Information is delivered via email after the staff searches the provider network for applicable lending options. With a 48-hour delivery time for funding, Torro takes much of the stress and hassle out of the financing process. An advisor from the company works personally with each business to address questions and concerns about funding before turning them over to their chosen provider. Since they don’t lend money directly, you communicate with the lender from their network after finalizing a loan agreement. No collateral is required to apply for funding, although some lenders may ask for proof of specific assets to secure larger loans. When applying, you have the chance to request a specific loan amount ranging from $5,000 to $575,000. The final amount for which you qualify is determined by the lender as are all associated terms and fees. Due to the extensive and varied nature of the Torro network, no basic term structure or fee information is available prior to applying. They work to provide “loan programs custom-tailored to fit your business”, so you should be able to secure a loan close to the amount you request as long as you meet the basic qualification requirements for the loan type. However, qualification information can be difficult to find on the site, so you may discover you’re not eligible for as much as you wish to borrow. Credit score may or may not be a big factor in a lender’s willingness to work with your business. Whereas you may find your application rejected for poor credit if you approach a lender on your own, Torro filters out unsuitable lending options and only delivers information from providers who work with companies in your current financial state. Since the application asks for your credit score up front, make sure you have an accurate assessment of your rating so that you get matched with appropriate providers. Each provider in the list Torro sends after approving your application has different terms, rates, and fees. Before choosing a lender to partner with, you have to review the information and decide which funding source has the most reasonable offer on the loan type you requested. This may require reviewing your business budget and considering other obligations to determine how much you can allot to pay off the debt each month. You then agree to the repayment plan with your chosen lender and provide any other requested information to receive your funding. They try to offer as many options as possible based on your initial application. The number of potential options appears after you enter basic personal data but before you share more financial details, thus allowing you to assess your chances of getting the money you need. The final amount for which you qualify is up to individual lenders and depends on a range of factors. You don’t have to agree to any of the proposed terms if you decide that none of their suggestions are right for your business. If you have questions about any part of the application or lending process, help is available via phone Monday through Friday from 8 am to 5 pm PT. You can also email them at any time for information or support. Live chat on their website site can provide immediate help when you’re in need of quick answers before applying or while you’re filling out an application. Should a representative not be available, it’s possible to leave a message in the chat box so that they can contact you later. The site does lack certain resources provided by similar lenders. For instance, you won’t find a blog or an FAQ page. However, Torro connects customers with in-house help to serve as a guide through the process of obtaining funding. Any questions you have after submitting your application can be directed to this advisor. 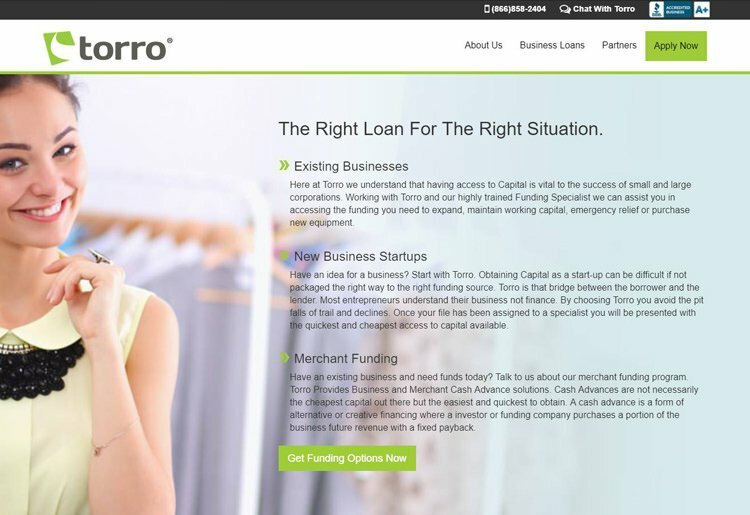 Torro offers five main types of business funding for new and existing companies, including startup funds, working capital loans, and merchant cash advances. The application process is simple, approval is fast, and funding is usually received within 48 hours. By using basic personal and business information to suggest a selection of suitable lenders, Torro’s loan matching process makes it easy to find the funding your company needs. Whether you’re just starting to build your dream business or you’re planning to expand a successful venture, Torro’s network of lenders may be able to help. Torro was founded in 2012 to connect businesses with a wide network of potential lenders. Since joining the Better Business Bureau in 2016, they have earned an A+ rating and remain an accredited member of the Bureau. The company works with both startups and established businesses to provide funding for a variety of common expenses. With a network that includes banks, alternative lenders, and online lending marketplaces, Torro is able to find funding even for companies without stellar credit ratings. In addition, their staff provides personalized guidance for each customer. This sets the company apart from those that offer “robotic underwriting” and makes the funding process simple for each qualifying business.